The fat girl pressed herself against the huge sea creature, arms outstretched across the rough black hide. She closed her eyes and laid her cheek against the whale's side. "Do not go gentle," she whispered to the beast. "Rage against it". 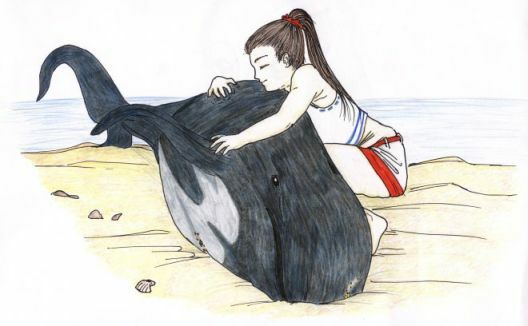 She relaxed against the whale's body, all physical strength draining as she concentrated her energy on communication with the animal. She began to feel that they were one, that her flesh was melting into hide. She could feel the slow booming heartbeat and the agonized raspy breathing. Sounds around them began to fade--the crying of seagulls, the roar of the waves, the panting of the old couple as they trekked back and forth through the surf filling their buckets and splashing the seawater on the helpless mammal. All at once sound stopped entirely and she felt that she had crossed over some mental barrier into an unfamiliar world of sensation. She realized that she was somehow within the whale. She heard the whale's name, an unpronounceable, melodious name, like the thrumming of fingers over the deepest octave of the great Celtic harp. She saw the world as the whale saw it, radiant green and blue energies of life surrounding everything on the beach. She felt the pain of the struggle for breath, the fight to inhale through the small blowhole, the pain of lungs that could not fill under the great pressure of the landlocked body. She saw something more, too; the history, the memories of the creature. She saw her birth in the warm blue waters of the south. She saw her cavorting in the waves with her pod. She saw the calf lost to sharks, and another lost years later to men. Later, working with a team of graduate students, a biologist would necropsy the whale. The old couple would wander back to their hotel room, where they would shower together for the first time in years, giggling like schoolchildren, make energetic love on the softly carpeted floor, and finally fall into a deep and peaceful slumber in the cozy double bed. Much later, when the moon had risen, the fat girl would make her way to a different beach, a much gentler cove dotted with still tidepools and smooth agate pebbles. There she would strip off her oversized clothes and wade into the cold surf. She was buoyant and graceful and no longer floundered awkwardly as she swam. The moon shone on her round white body. She was no longer afraid of sharks. She was no longer afraid of anything at all.